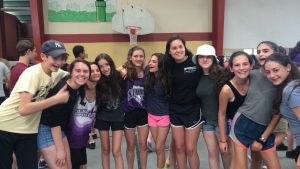 After their hikes, the chanichim returned to their rooms at the Highland Center to shower and get ready for dinner. We ate a warm dinner of pasta, meatballs, chicken nuggets, and rice. Post dinner, the chanichim enjoyed a bonfire complete with s’mores and singing. On Tuesday morning, the chanichim woke up bright and early, ready for a fun-filled day of hiking and enjoying more Highland Center programming. The day began with alternative tfillot; the banim (boys) talked about the reasons behind wearing t’fillin, while the banot (girls) did meditation, stretching, and yoga. After breakfast, the chanichim were split into three different groups and rotated through three stations: leave no trace, mapping and compasses, and fire building. 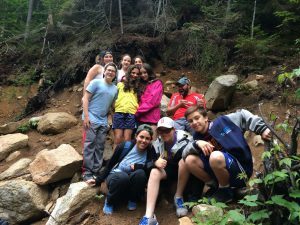 The chanichim learned new skills and new information that they were able to apply to their hikes that afternoon. Again, the chanichim were split into six groups and did the type of hike they had not done the day before. As the day turned into night, the chanichim enjoyed a barbeque dinner. The night culminated in activities planned by the Highland Center where they learned about astronomy. The evening ended with a rousing rendition of rad hayom (the end of the day song). The chanichim then returned to their tzrifim (bunks) and quickly fell asleep, exhausted from their exciting time at the Highland Center.